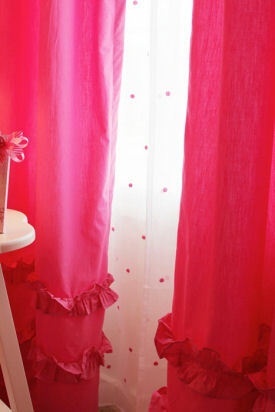 Pink baby girl nursery with striped walls, ruffled fuschia curtains and polka dot sheers. 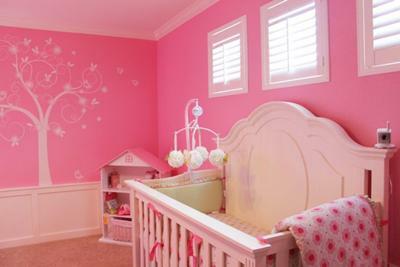 There are SO many decorating ideas to show you in this "Pink-a-Licious" pink nursery decorated by Lara Mark owner of Lara Mark Designs for a special baby girl. Prepare to stay awhile because if you are in the process of decorating a baby girl nursery of your own, you will not want to miss a single detail; this room is just that cute! It was difficult to believe that this nursery was the debut project of her interior design business. Can anyone really be that good just starting out? Yes, a decorator like Lara can be just that amazing as you will see in the following nursery pictures! In addition to the striped wall painting technique, Lara decorated with polka dots, flowers and added many special touches that make a very unique presentation. The walls are painted with stripes in different shades of pink by Benjamin Moore called Pink Carnation and Blushing Bride. The warmth of the nursery's color scheme is balanced by just the right amount of green in the crib bedding set. 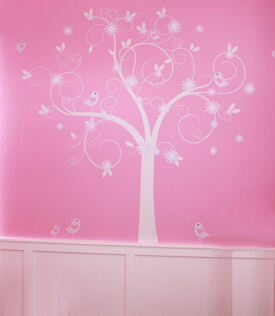 The branches of the tree wall decal on the upper portion of the nursery wall are covered with flowers and birds. Lara did a super job of choosing the perfect tree wall decal in spite of the many, many choices offered by an Etsy store called Wall Art Design. A window beside the chair and ottoman set give mom and baby natural light and a nice view. The floor length ruffled fuchsia (?) curtain panels can be pulled back to display the pink and white polka dot sheers. Who would mind spending (more than) a few nights in their baby's room with a comfortable seating arrangement? The chenille glider rocker in pink was an online purchase from Costco. The comforts as well as the utility features of the baby's nursery are both functional and attractive. 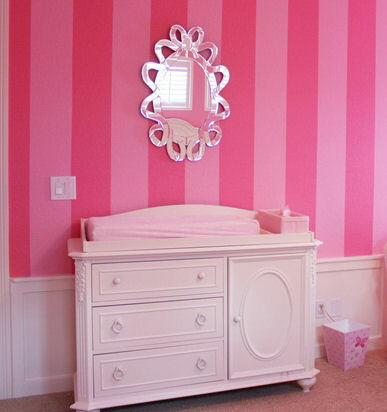 The antique white dresser and changing table are shown to full advantage against the bright, pink striped accent wall. The mirror, a lucky find from Walmart, reflects the light and makes an already spacious room seem even larger. 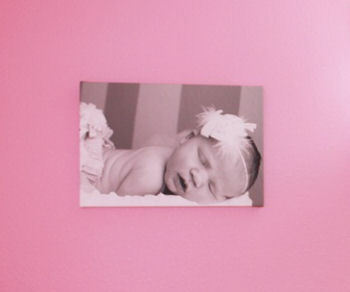 Before we conclude our tour of this adorable (bear with me, I just love saying this) "Pink-a-Licious" nursery, we have baby photos! I would like to thank Lara for allowing Unique Baby Gear Ideas to share her pictures and DIY projects and crafts with our visitors! Please visit Lara Mark Designs and Lara Mark Photography on Facebook and "Like" to see more of her work. I am looking for paint color recommendations for a Strawberry Shortcake themed room and I think these colors will work. Thanks for posting the names of the paints that you used for the striped walls. How wide are the stripes? The nursery is gorgeous!